The team might get another trip in the Lifeboat. After NBC cancelled their Timeless TV show, yesterday, creators Eric Kripke and Shawn Ryan indicated that Sony will like shop season two of the time travel drama around. Kripke and Ryan weren’t the only Timeless vets responding to the cancellation on social media. 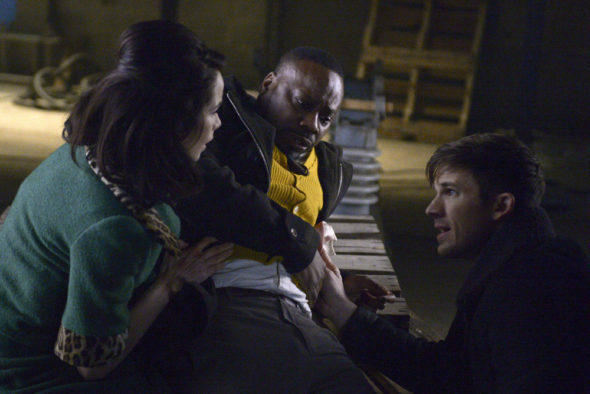 Stars Matt Lanter, Abigail Spencer, and Malcolm Barrett also shared their thoughts about Timeless being cancelled after one season on NBC. The series also stars Goran Visnjic, Paterson Joseph, Sakina Jaffrey, and Claudia Doumit. While it sounds like there is a chance at renewal, they don’t sound overly optimistic. Meanwhile, Lantner and Spencer tried to keep positive in their responses to the cancellation. Guess it's time to hang up my time-traveling boots. People always say, "don't live in the past"…. I don't know man.. we sure had some fun. Been on some epic adventures with these guys. This is our first scene with the Lifeboat filming the pilot. What a journey huh @abigailspencer and @verbalberappin ? A sincere thank you to our creators Eric Kripke & Shawn Ryan. To our incredible cast and writers. Our dedicated crew and DEFINITELY to our awesome FANS!! #Timeless Ps. Just so y'all know, Sony is shopping it around to see if another network may want more time traveling adventures! Ya never know. Barrett, on the other hand, let it all hang out, while posting this video reaction. The first season of Timeless averaged a 1.10 rating in the 18-49 demographic and drew an average total audience of 4.62 million viewers. Those numbers could still be appealing to a smaller network or streaming service. What do you think? Did you watch the first season of the Timeless TV series? Should NBC have cancelled or renewed it for a second season? Do you think another network or streaming service will order Timeless, season two? 5/13 update: NBC has reversed their decision and has renewed Timeless for a second season. Details here. What is NBC thinking…RENEW, RENEW for season 2!!! All of my friends and family so enjoy TIMELESS. Please RENEW. We’ve been waiting for return of this show! Talk about being devastated. Great show, and with the history content, a perfect blend. I will watch is where ever it goes or what I have to pay. All the best to the Cast, Crew and Writers. NBC, not so much! As a teacher I am very upset over the cancellation of Timeless. NBC should keep this program for its educational value if for no other reason. Money should not be the main consideration in keeping a program on the air. NBC, keep your network classy by opting for something better than so called “reality” and gratuitous violence! Love Love Love this show please don’t cancel!!!! I love this show! Please, please find a new home for this really interesting show. SOMEBODY HAS TO KEEP THIS SHOW ON THE AIR! ONE OF THE BEST CONCEPT SHOWS IN A LONG TIME, AND WHAT DO THEY DO??? PLEASE, PLEASE DON’T TAKE THIS SHOW AWAY. SO FAR I HAVE LOST SO MANY OF MY FAVORITE SHOWS (GRIMM, ONE OF MY FOREVER FAVORITES, BEAUTY AND THE BEAST, TEEN WOLF STAR-CROSSED….THE LIST GOES ON). MATT LANTER HAS BEEN A FAVORITE OF MINE FOR YEARS. HE DESERVES HIS SHOW BACK!!! PLEASE RECONSIDER NBC AND BRING BACK OUR SHOW!! Not surprising every show I think is great the network disagrees and cancels. That was a great show and cast.